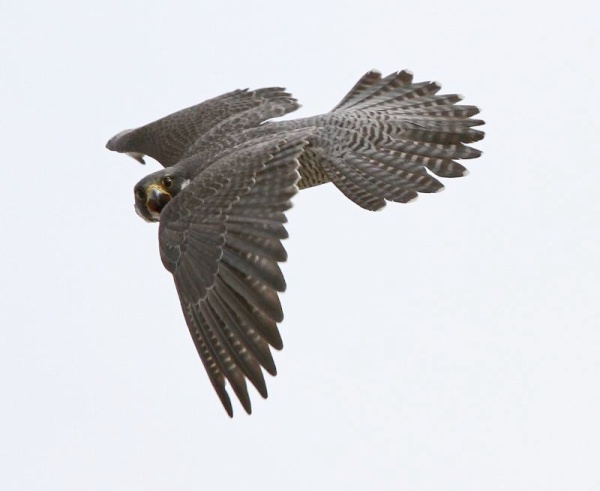 Adult peregrines have four main vocalizations — only four. How many peregrines are present at the time? What are the peregrines doing? Are they perched or flying? Are the peregrines at their nest site or somewhere else? Are there eggs or chicks in the nest? Is a non-peregrine enemy present? What else is going on in the vicinity? “Peregrine Falcon (Falco peregrinus)” xeno-canto by Paulo Belo. Genre: Falconidae. “Peregrine Falcon (Falco peregrinus)” xeno-canto by Romuald Mikusek. Genre: Falconidae. Wail: Click here to hear a recording that’s labeled ‘alarm call’ but in fact is a wail out of context … it might even be an advertisement wail. Two peregrines in Ecuador in the winter, ee-chup plus wail. One peregrine is diving on another one on the ground, perhaps to make him go away. My guess is that the ee-chupper is saying “I see you, Other Peregrine” and the wailer is saying “I want you to stop annoying me!” It’s important to note that without seeing these two peregrines it’s impossible to know what they’re really saying. “Peregrine Falcon (Falco peregrinus)” from xeno-canto by Bernard BOUSQUET. Genre: Falconidae. p.s. Many thanks to Chad+Chris Saladin who explained the first three vocalizations and showed them to me in context at the Hope Memorial Bridge, Cleveland, Ohio. Thank You Kate ! Thank You Chis &Chad ! Thank you Kate. I learn so much from your blog. I have a falcon that has been constantly sounding dawn til dusk for at least for or more day. It dose not seem like a baby is down. It may have lost it’s mate? There are crows but they are not attacking. It is like every minute and is getting really irritating. There is nothing I can do. Michael J Cummins, there’s a hawk that makes a lot of noise near it’s nest: the red-shouldered hawk. They are especially noisy in Florida. I believe they stop when the breeding season is over. … But I’ll have to look into that.